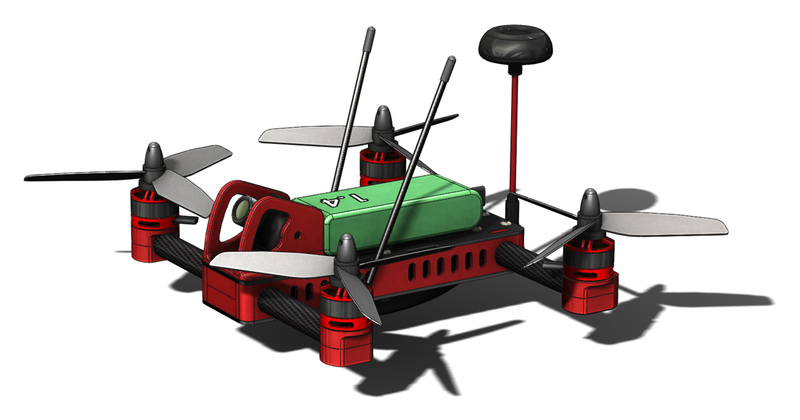 I finally have the design of the 215 Hopper at a point where I think it is fit for purpose as an FPV copter. It can now sustain a heavy grounding without terminal damage. I still won’t claim that it is as durable as a carbon plate design but I am now happy to release it. 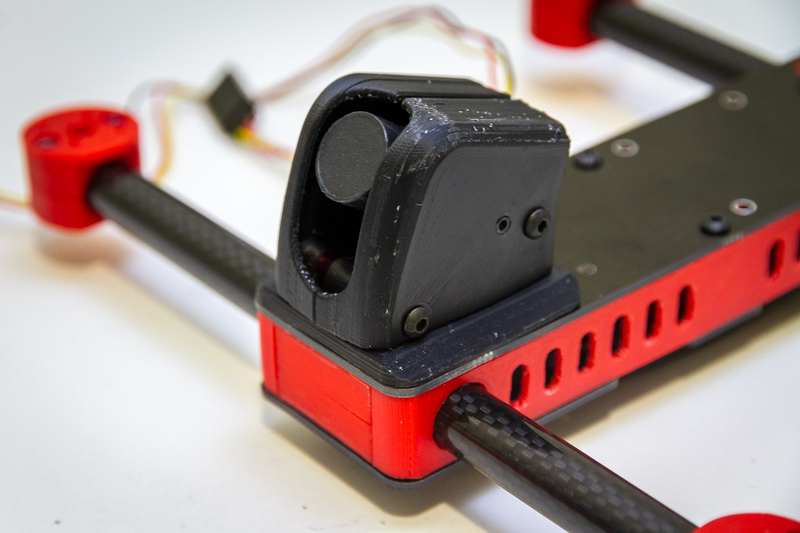 The camera pod is perhaps the least durable part of the design however I am still flying with the first one I printed and it has served its purpose protecting the flight cam. 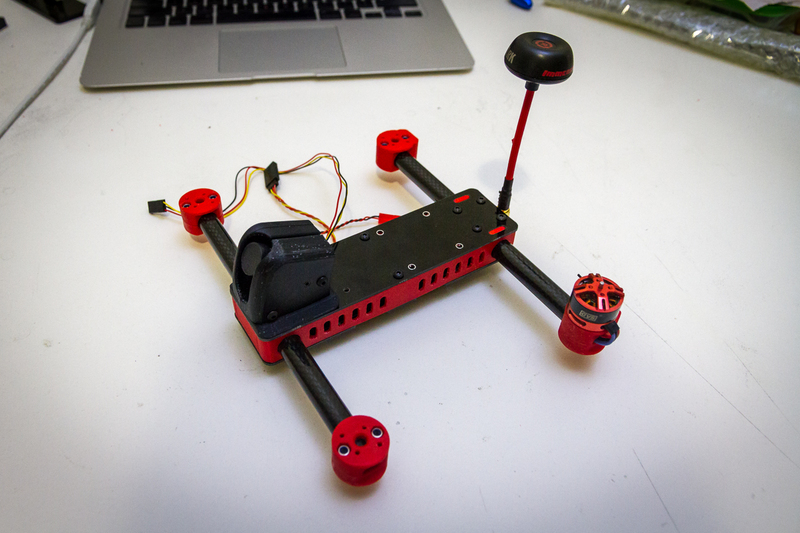 I do intend to upgrade it at some point but that will probably come after the custom camera pod for my Shendrones Tweaker. 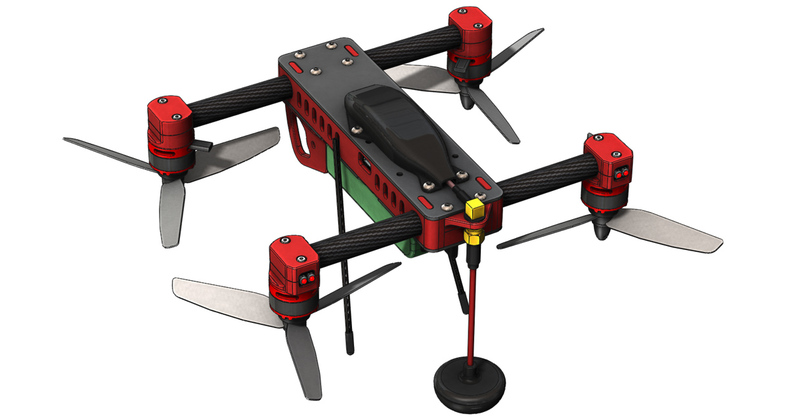 I have made 2 changes to the previously seen FPV design iteration to realise these durability improvements. Firstly I scrapped the idea of running the motor wires through the arm tubes. Whilst I think this still has merit, for now it was causing more problems than it was solving. I will perhaps look at it again in the future. I have however maintained a similar motor mounting arrangement. All 4 M2 threads are used to attach the motor to the top half of the motor mount with the motor wires aligned with the arms. Separate bolts are used to clamp the motor mount to the arm tubes. The second change is specifically to do with the clamping bolts on the motor mounts. Now rather than simply clamping on to the tube end and relying on friction to keep it in place I have created a positive interaction between tube and mount. As seen in this exploded view of the motor mount the tubes are now drilled with a 5mm hole to accept the same 15mm M3 standoff that is used throughout the rest of the frame build. The 2 printed parts of the motor mounts then snap over these standoffs and are clamped together with M3x8 button head screws. The only trick to this is that the standoffs must be screwed in to the top half of the mount before the motor is subsequently mounted to that before it is finally installed on the arm. At the same time as making these motor mount changes I decided to keep things simple and remove the LED tail lights. Now the same 2 parts are used at all 4 corners. 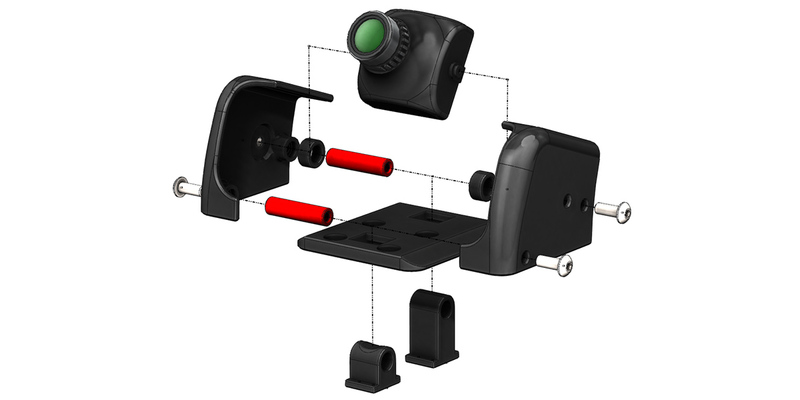 Speaking of parts, the image below shows all the parts required to build the 215 Hopper FPV edition. All the 3D printed parts are printed in ABS with a 30% infill, 3 outlines, 3 solid bottom layers and 4 solid top layers. Colour is unimportant but I find it looks its best if the frame parts are a bright colour (as seen here in orange or previously in red) and the accessory parts are black. An important detail to note when assembling the frame is that the flight controller should be in the front half of the craft. 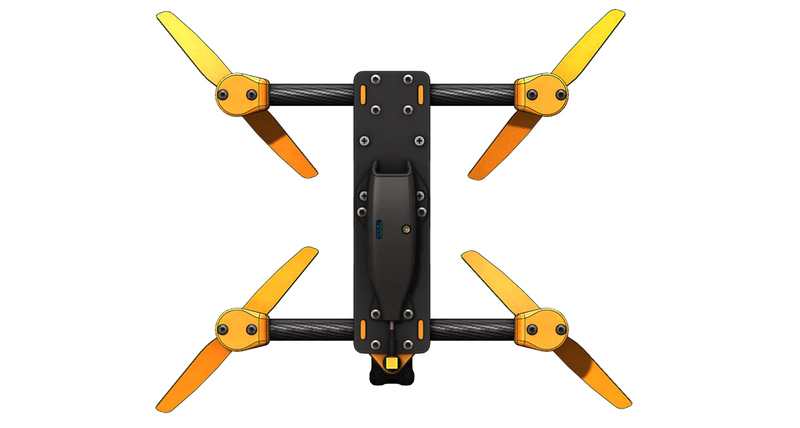 The reason for this, as I noted on a previous post, is that the vTx pod must fit around the nylon screws used for mounting the flight controller. There are holes specifically for this purpose in the pod. Another new feature on the vTx pod is the inclusion of the slot seen below. This allows you to see what band and channel is selected on the vTx and also if it is transmitting or not. This small details makes working with this specific transmitter significantly less frustrating. 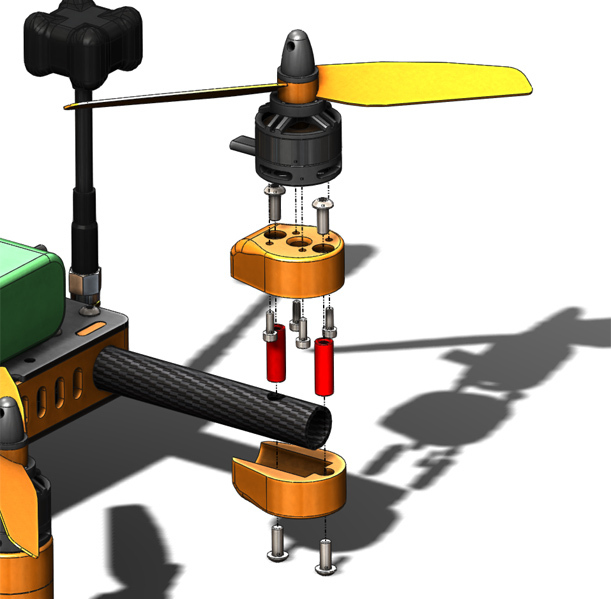 A lot of the notes I made regarding the initial build (found here) also apply to putting together this FPV version. In lieu of a full write up for this I will direct you to that if your would like to build one for yourself. Also please feel free to contact me or leave a comment here with any questions that you might have. Whilst not strictly necessary I solvent welded the 3 parts of the camera mount together (parts 131, 132 and 133). Durability has exceeded my expectations so that is probably a worthwhile step to take. As I have left over PCB’s from my first batch I have not modified the bottom board to include a hole for passing the vTx wiring. You will need to drill this just in front of where it will connect to the vTx. It should end up just inside the ‘mouth’ of the pod. As the motors are now fixed to the tubes drilling the holes through which the mounts pass is critical. They must be aligned end to end. For this I have included part 215H 139 which is a drilling jig. Print two and slide one on to either end of the arm tube. You can then use the flat sides for alignment. I suggest holding the jig with a clamp or vice whilst drilling as the thin wall carbon has a tendency to grab onto the drill bit. If you decide to build one i would love to see it! let me know about it here or post it up as a build on thingiverse. Over the weekend just past I got my first solid session flying FPV under my belt. 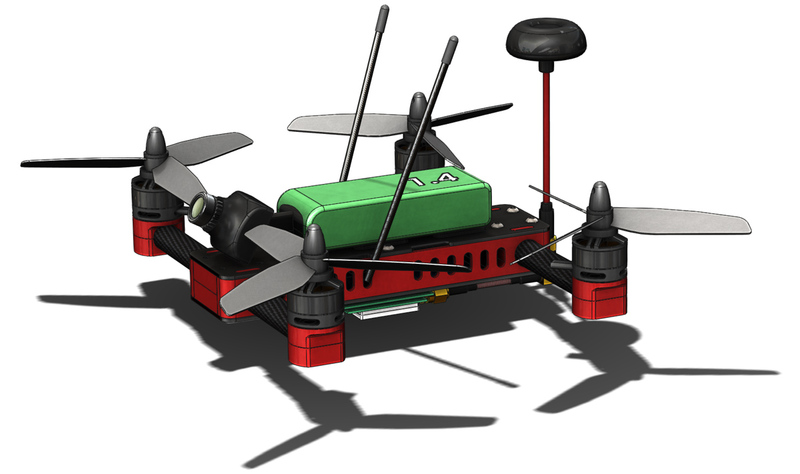 This of course means, as the title of this post also states, that my FPV build of my 215 Hopper design is complete. The new routing for the motor wires, through the arms, came up short. An extra 10mm or so and I would have run them as they were. As it is though I ended up extending the wires. 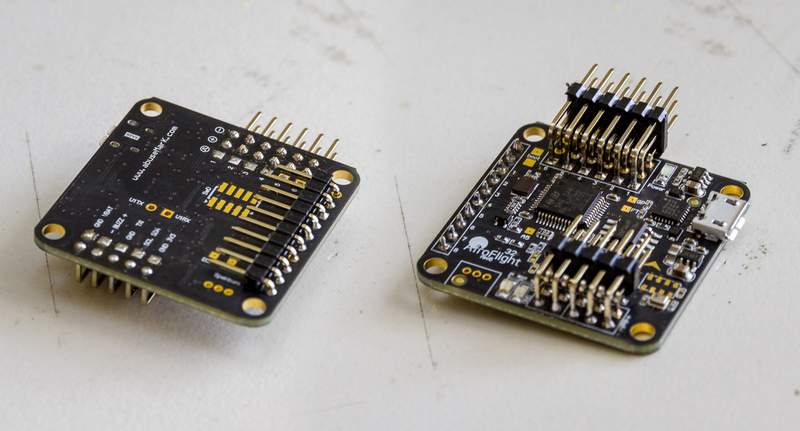 This also made soldering them to the ESC’s a simpler task so it was a good move in the end. Despite the extra complexity in the build I am very pleased with how this aspect of the design turned out. 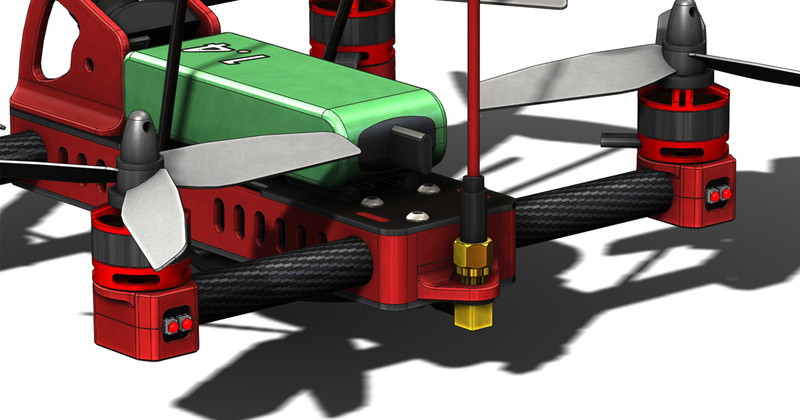 My initial design for the base plate of the camera mount fouled on the zip ties that hold the ESC’s in place. I had to shorten that and print the new design. My initial design for the video transmitter carrier fouled on the heads of the screws that mount the flight controller. This was actually 2 errors rolled into one. I absentmindedly assembled the frame back to front with respect to the flight controller. i.e. the flight controller is in the front half rather than the rear half. This doesnt make any difference flight wise but it would have meant the carrier wouldn’t have fitted up even if I had accounted for the flight controller screws. The second failure with the video transmitter carrier design is also the same failure as with the camera mount. It is a lesson that I have learnt the hard way on to many occasions and it is thus; If you are using CAD use it fully, every detail should be represented in your model. If you leave something out, either intentionally or inadvertently it will come back to bite you at a later stage of the project. In the case of the camera mount I didn’t even have the holes for the zip ties let alone the zip ties themselves. For the transmitter carrier I didn’t have the screws in my model. Thankfully having the 3D printer on hand meant that I could correct these errors in the space of an evening and was ready to fly on saturday morning. With the new build came new batteries, I am now flying on 4S 1400mAh batteries (hobbyking) and loving it. I went with the higher discharge rate option, it is perhaps overkill but it means I get much further through the capacity of the battery before voltage sag starts hitting my warning levels. Other than the mentioned hiccups the build was much the same as the ‘base model’ 215 Hopper as I detailed here. 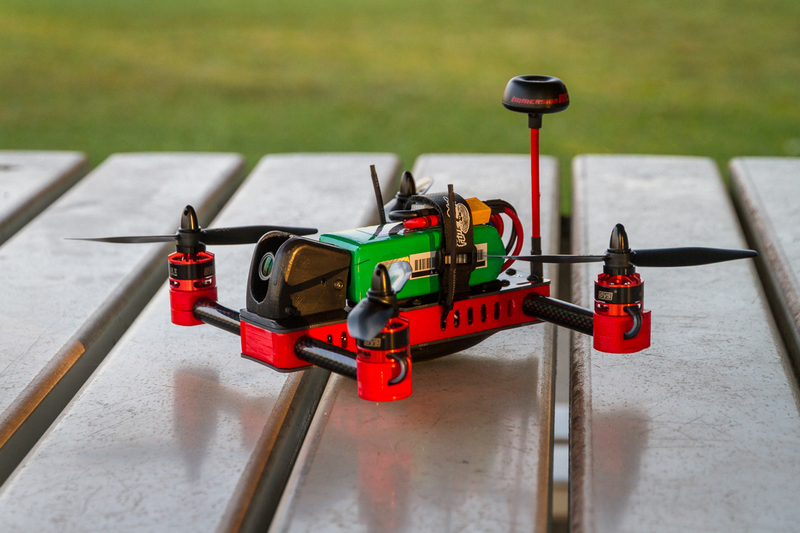 I will put together a similar writeup for the FPV model in the near future. The design files will also be available. On top of that I now have a big stack of PCB’s for the build which I will make available for purchase. 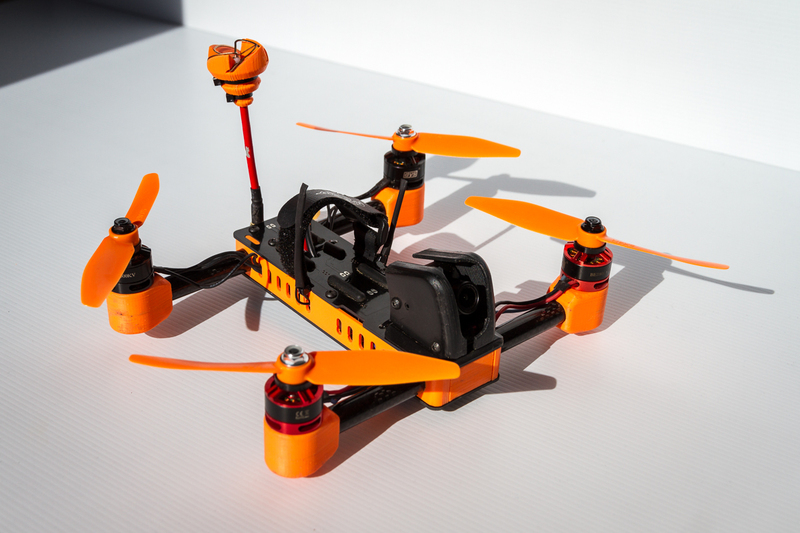 A full frame kit with hardware and 3D printed parts may also be an option. After the mad rush of getting my ultimaker operational and making my Iron Man mask I have finally been able to get back to my FPV build of the 215 Hopper. I now have all the frame components made and there are some significant changes from the original. To start off with though, a tale of my first FPV session. As soon as I had all the pieces needed to fly FPV I had to try it. Knowing that my dedicated FPV build was still a couple of weeks away I rigged up the Hopper, mostly with cable ties and temporary wiring but also my first iteration of the camera mount/crash protection. The first couple of batteries were trouble free. Landings were rough but I was mostly taking things very easy, it was certainly a cool experience and all the gear performed flawlessly. On the third battery I hit the ground quite heavily. Looking back at why I have realised that I basically flew it into the ground forgetting that maximum lift (i.e. 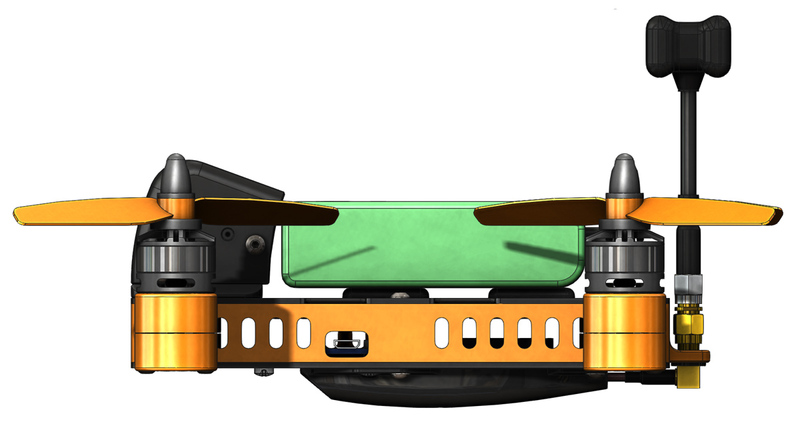 quadcopter level) is going to be achieved with the camera pointing mostly towards to sky. When I came down I was looking mostly at the ground despite thinking I was pulling up. As can be seen below the airframe itself suffered no real damage. The motors all twisted on their tubes but that is easy to correct. Unfortunately one of the motors also came off its tube, the spinning prop cut one of its wires and pulled it out of the motor at the same time. The VTx also collected a lot of dirt given that it is exposed beneath the airframe. The roll hoop around the camera snapped as the quad tumbled, I guess this means it did its job of preventing the camera being a point of impact. All these factors combined meant that I decided not to fly with this cobbled together rig, I would wait until everything was in its proper place. To address the wire cutting issue I have decided to route the wires through the tubes rather than hanging them loose around the arms. To achieve this I have had to redesign the motor mount. Previously the 2 parts of the motor mount and the motor were all clamped to the tube using the motor mounting bolts however the spacing meant that they could only just fit around the 12mm tube. This forces the wires to exit at 45° to the tube, in reality this would probably be fine but my sense of details told me to rotate them so the wires exit parallel with the tubes. To do this the new motor mounts incorporate their own M3 clamping bolts with captive nuts. To assemble them the top half of the tube clamp is bolted to the bottom of the motor (now using all 4 M2’s) before the two halves are clamped around the tube. The new mounts also include a slot on the end for passing the wires in to the tube. As mentioned in one of my design posts the rear motor mounts now also incorporate a small pocket for LED tail lights. I haven’t designed the tiny PCB for that yet but the image below shows where they will be with the power supply wires hanging out. I’ve been really impressed with the detail I have been able to model in to these parts. The wire grooves through the middle of these are only 1.5mm wide but are reproduced in perfectly useable fashion without needing to make any adjustments to my default print settings. At the rear the modified tube clamp for mounting the antenna has come up nicely but I may need to make a counter bore for the nut. The antenna itself is only just getting tight. All of the tube clamps are also modified on the inside with a hole for the motor wires to come through. Underneath I am very please with the VTx housing. 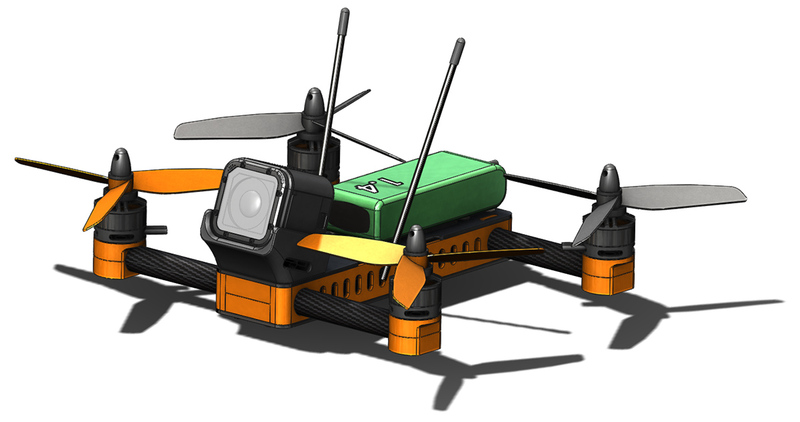 I completed the details of its design after receiving my Lumenier TX5GPro Mini 600mW (GetFPV). It now sits inside the housing with no extra support required and is protected by thick ribs on the inside of the housing. The wires will be routed through the PCB rather than coming out the front as in the photo below. And finally the camera mount. There are a few pieces to the current solution but it allows for a lot of flexibility and feels much more robust than my first attempt. The camera is held in place by the clamping effect of the bolts in each side, it can be adjusted from 0° to 45° above horizontal. To install it the base plate is attached to the airframe clamping the two posts in place before the threaded standoffs are inserted and each side of the housing is clamped around the camera. I also decided that the less conspicuous look of black was better than a big red blob on the front. Next up is all the internals. I already have everything on hand so it won’t be too long before this is in the air. Working from the concept layout for carrying FPV gear on the 215 Hopper which I wrote about previously I have developed a few new parts which can be 3D printed. I have come up with a camera bracket with an integrated ‘roll cage’. The camera angle is set with a 3D printed wedge behind it. On the bottom I have created something of a streamlined housing to go over the video transmitter. Of particular note in this area; when I dropped the model of the ImmersionRC transmitter in place I was quite surprised how large it actually was. As such I went looking for a smaller unit. I have consequently also picked up a Lumenier Tx5GPro mini 600mW TX (GetFPV). I will compare the two when they both arrive but suspect I will run the Lumenier rather the the IRC and as such that is what I have designed the pod to fit around. When I actually have the transmitter in front of me I will be able to flesh out the internal details of the pod so that the TX is a nice snap fit inside. At the rear I have modified one of the central tube clamps to include a bracket for screwing the SMA 90° connector to. The antenna is then subsequently connected on top. Hopefully this provides enough support and isolation to prevent any damage to the transmitter in the event of an antenna strike. Also of note here is the addition of tail lights. As I can’t run the traditional WS2812b LED’s with the telemetry on a soft serial port these will just be on whenever the battery is connected. I am adding them for LOS flying visibility as much as anything. There have been a couple of occasions with the 215 Hopper (including when I lost the first build) where I have struggled to orient the craft even at relatively close distances. The hope here is that with a few super bright LED’s pointing in one direction such problems will be easier to resolve. 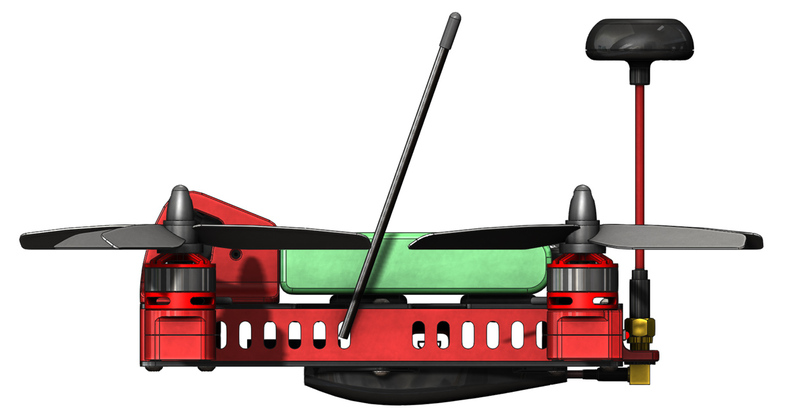 And finally, I have made a decision on goggles and decided to go with the FatShark Dominator V3 (NextFPV) running a NextWave race band module (NextFPV). I haven’t received them yet (only ordered yesterday) but will make some comments on them when I do. 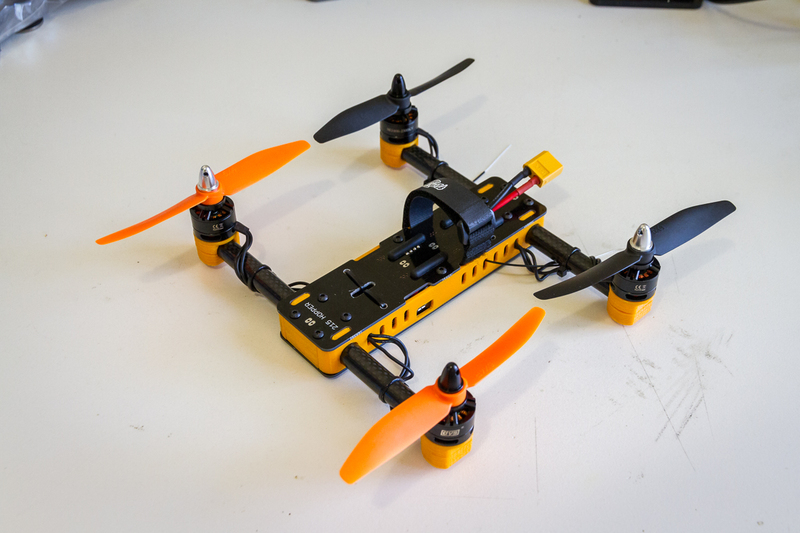 In the same order I picked up another Naze32 and a set of esc’s so I can build this ‘215 Hopper FPV’ up as a new a rig and keep the other one flyable. 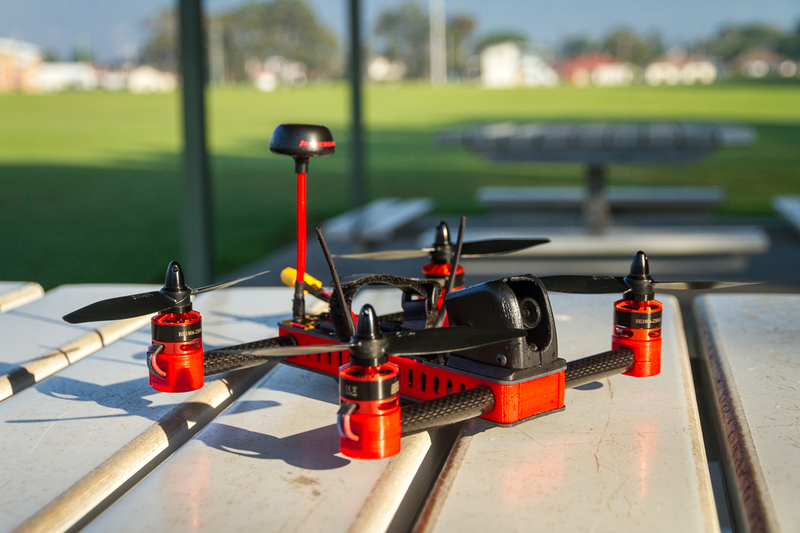 Recently I flew with a couple of other pilots for the first time, one of whom had an FPV rig. As soon as he flew off in to the distance I knew that I had to get into FPV as soon as possible. So now I have bitten the bullet and started to put together and FPV kit. 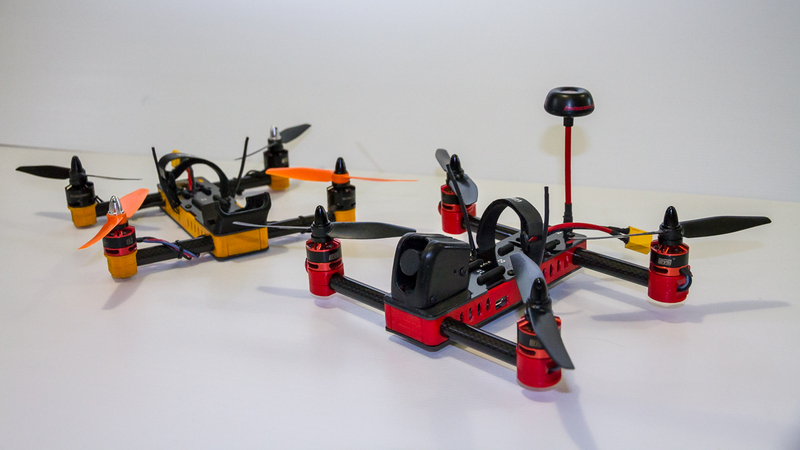 I haven’t purchased a set of goggles yet as there is some internal debate about starting at the cheap end with something like the Eachine VR-007 or spending the money upfront and getting the Fatshark Dominator V3’s. I’m currently leaning towards the latter option. 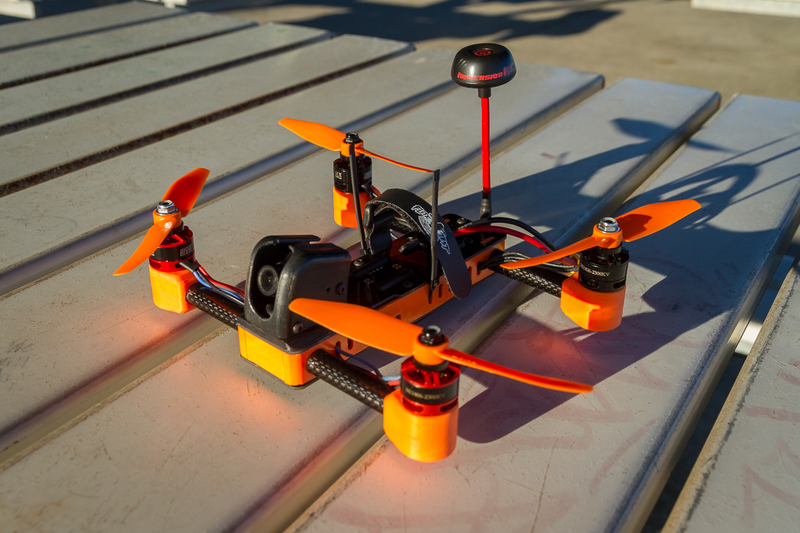 Camera – Foxeer HS1189 XAT1200M (NextFPV) – Primarily chosen for the 16:9 aspect ratio. To start with I will keep things as simple as possible so no OSD or any other extra bits, just this basic video system. So far I have only received the camera, I am still waiting for my Hobby King order, however I decided I would start roughing out a layout to see how all the parts are going to fit onto the 215 Hopper platform. My progress can be seen below. 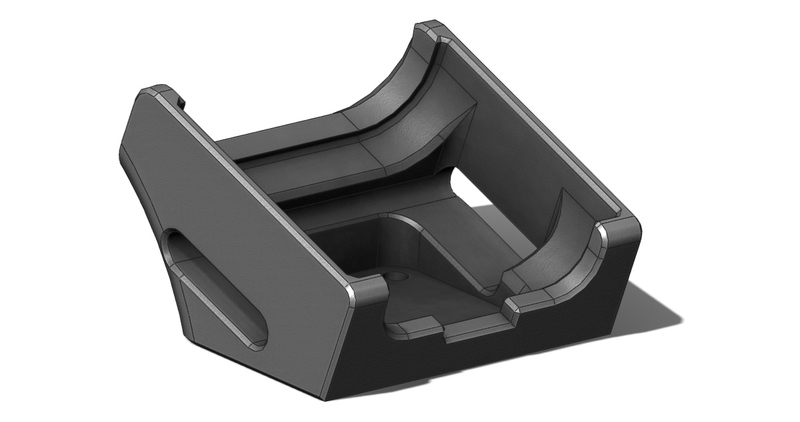 Obviously I need to design brackets and housings for the various parts but this shows how it might be laid out. To differentiate the FPV version I thought a colour change was in order (I’ve also just bought red filament, the orange will go go back to Steelcity Electronics before too long). As promised supplied here in is everything required to put a 215 Hopper together exactly as I have built it. Please see the end of this article for an update regrading a mistake with the originally supplied brd file. 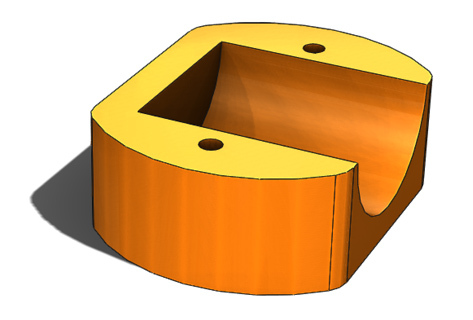 The digital assets can be found on YouMagine or Thingiverse. There is nothing specific about the 3D printing requirements, 15-20% infill will do the job and a typical 0.2mm layer height is ok.
For the PCB’s I typically use Dirty PCB’s from Dangerous Prototypes. The brd file to submit is included with the digital assets. Options you will need to specify are 1.6mm thickness, color black (or your preference) and ’10×10 max’ for the size. 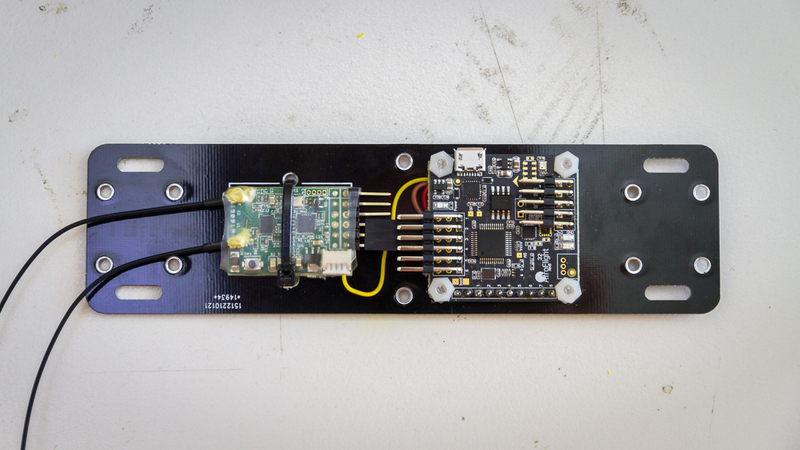 Note that I have found some flexibility with this limit as this board is actually larger than 10cm in one direction, I got no questions when ordering my first batch (of which I still have 8 unused). The cost they offer can’t be beaten but do note that they are a bare bones sort of service so support is limited, what you submit is what you get. 4x ZTW Spider Series 18A Opto Lite (NextFPV) This could be considered overkill from a power point of view, I chose it for its svelte size and preloaded blheli. MultiStar Racer Series 1400mAh 3S 40-80C LiPo (Hobby King) I usually start with 3 of a particular battery size but the more you get the more you can fly. 5×4 Propellers (NextFPV) I like to use a bright colour (usually orange or green) on the front and black on the rear to help with orientation. 4 propellers are required, 2 CW and 2 CCW, but buy plenty of spares. 500mm x 12mm x 10mm carbon tube (ebay) Cut in to two pieces, both 183mm long, there will be a short piece left over. 8x M2x16mm torx socket screws (ebay) A generic M2x16 cap or button head will also work however for anything smaller than an M3 I find that a torx socket is more reliable than a hex. 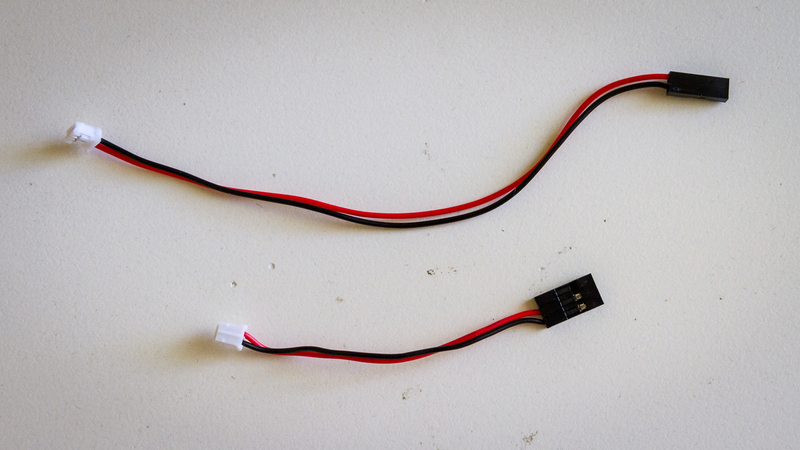 16 AWG silicone wire (Black Hobby King, Red Hobby King) This size wire is the largest size that will fit through the wire slot on the power distribution board. It is also the same size as the leads on the battery. XT60 female connector (Hobby King) Purchase 1 for every battery. I managed to fuse the XT30 connector together, admittedly whilst running 5 motors on a heavier rig, however I think the upgrade is still a worthwhile precaution. 2x JST-PH pre-wired plugs with sockets (ebay) for Vbatt and 5v connections on power distribution PCB. Self adhesive rubber feet 25mm(L) x 5mm(W) x 3mm(H) (Aliexpress) These seem a very uncommon size but are available if you are prepared to wait for delivery. 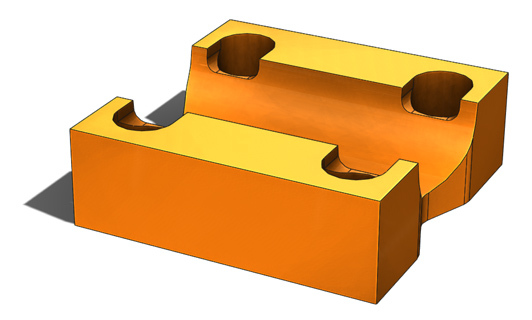 Alternatively anything that is 3mm thick can be used as a spacer. They are required as the battery wire penetrates the top plate below the battery. 3x 2 pin crimp connector housing (Pololu) For receiver power, SmartPort and Vbatt at Naze32. 2x 3 pin crimp connector housing (Pololu) for receiver connection and 5v connection to Naze32. Note that a lot of the links provide, particularly for small parts, direct you to sources that are sold in bulk lots. For example the M3x8mm hex socket button head screw I have linked are sold in a lot of 100. As you only need 20 do not purchase 20 of the linked item, 1 bag will give you enough to build 5 215 Hoppers. This is not an exhaustive step by step for building the 215 Hopper but rather a collection of build notes in the basic order of construction. 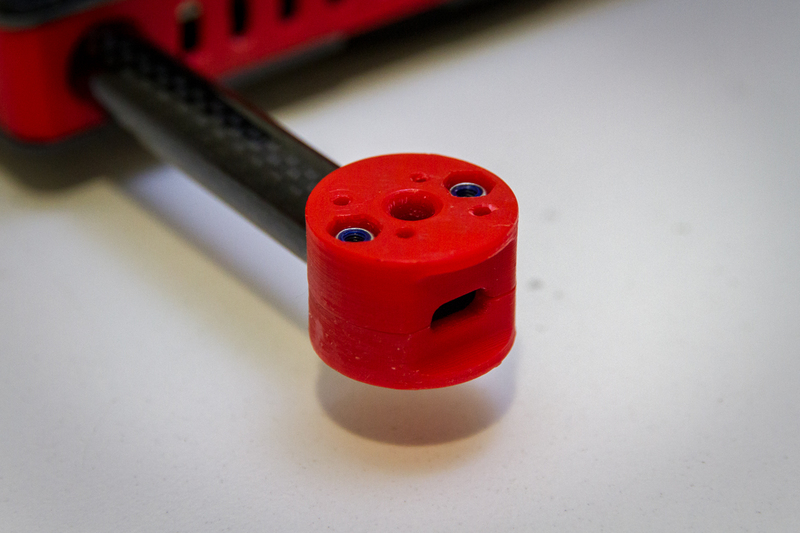 3D printed holes for fasteners should be drilled out to their finished size after printing. 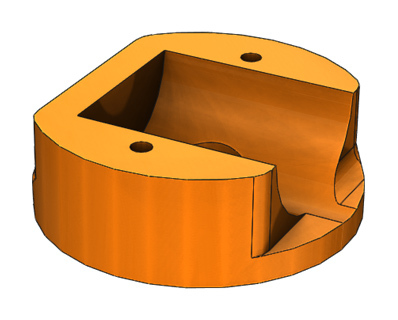 This includes the 5mm holes for the frame standoffs (parts 103, 108 and 111) and the 2mm holes in the motor mounts (parts 104 and 105). Depending on the quality and accuracy of your prints you may also need to clean up the counter bore for the head of the M2 fasteners. This detail can be particularly critical as there is very little thread engagement in the motors and getting the thread started can be challenging. If you are using a hand drill for this process take it very slowly and carefully. It is easy for the drill to bite and get pulled in too far. Grinding a flat point on to a spare drill bit can minimize this biting problem. The PCB needs to be split in to its two pieces along the tabs. Side cutters and a file will quickly tidy up any leftover material. Also round over any sharp edges where wires, zip ties and the battery strap rest. Clean up any edges on you 3D prints the prevent the parts fitting together nicely. Likely areas that can cause problems in this regard are the knobs that fit into the slots on the PCB’s and the wedge between the side panels and tube clamps. The holes in the side panels should be a loose fit around the tubes. Solder the 5v regulator and JST sockets in place on the power distribution board. Shorten the signal/ground connectors from the ESC’s. I found if left as they are supplied there is simply too much bulk in the tight confines of the 215 Hopper. Solder the motor wires directly to the ESC’s. This will mean that the wires must first be threaded through the last window in each end of the side plate. As previously mentioned this is a bit awkward and one of the shortcomings of the design. 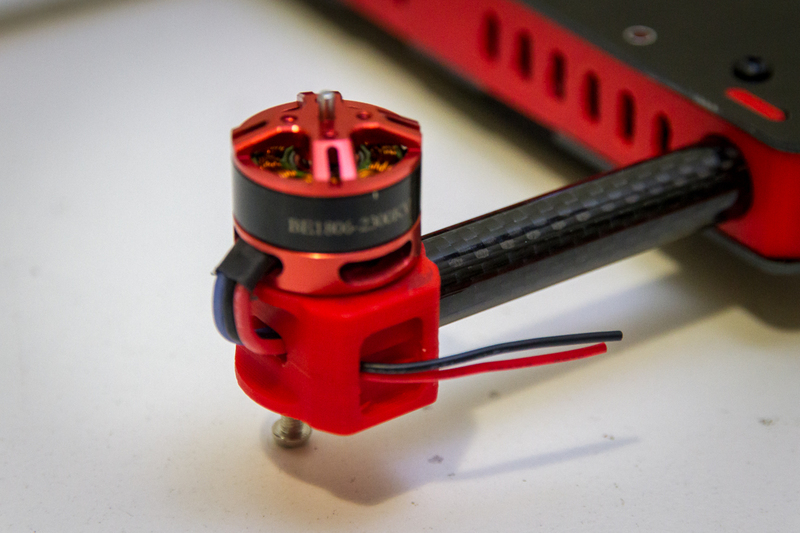 You will want to have a rough layout with arms and motor mounts in place to determine the length of wire required. Once the two previous adjustments have been made to the ESC’s reseal them with heat shrink tubing before cutting the input connections short and soldering them directly to the pads adjacent to the mounting points. Ensure you have the ESC up the correct way to match +ve and -ve connections. The ECS’s can be secured in place with zip ties. As there is no support for the signal wires a dab of hot glue will prevent them moving and possibly breaking. Solder 16 AWG wires on to each battery terminal and route the wire out through the rear slot. Trim the wires such that there is about 10-15mm of overhang past the end of the board. Attach the XT60 male connector to the end being careful with polarity. You may wish to position a battery to determine exactly how long you would like the battery connector to be. Prepare the SBus and SmartPort interconnects. The SBus interconnect should have a 3 pin connector at the receiver end. At the Naze32 end, 5v and GND should be on a 2 pin connector with the signal wire on its own 1 pin connector. The SmartPort interconnect need only connect the signal wire to both pins of a 2 pin connector. Use the breakout wire supplied with the X4r, remove excess wires and add a short loop between the two pins. Prepare the Vbatt and 5v interconnects. The Vbatt interconnect (pictured at top) should have a JST-PH connector on one end and a 2 pin connector at the other. The 5v interconnect (pictured at bottom) should have a JST-PH connector at one end. At the other end either a 3 pin or a 2 pin connector will work, on the Naze32 I connect it to motor port 5. Double and triple check voltages and polarity are correct before plugging either of these in to the flight controller. I damaged a receiver because on the initial board revision polarity of the 5v was reversed at the JST socket. This has been corrected on the supplied board layout. Motor ports – 90° header on top side and pointing away from centre. Digital ports – 90° header on bottom side and pointing towards centre. Auxiliary ports – 90° header on top side and pointing towards centre. This header will also need to be a little higher than usual to clear components on the board. 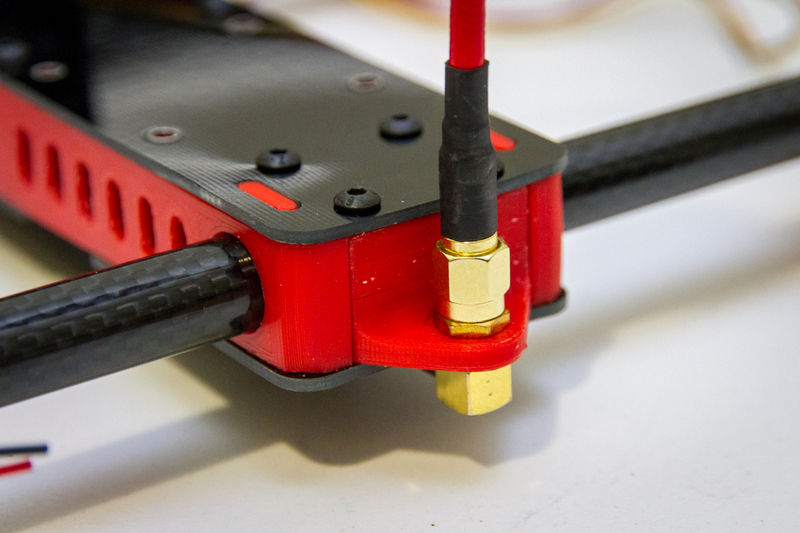 The easiest way to achieve this is to attach a connector before positioning the header strip. 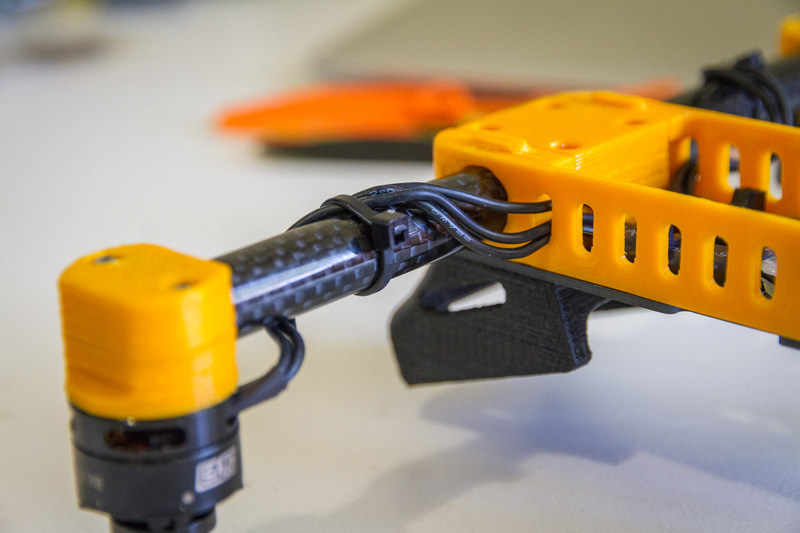 Positioning of connectors dictates that the x4r must be modified to fit correctly. For me this is not a concern as I only use SBus and usually dedicate a receiver to each model. After removing the cardboard housing trim to remove the top row of servo connectors (i.e. the row which SBus is NOT on). Snip the wires before the plastic so that the plastic can give whilst you are cutting it, this will prevent splitting through the bottom row. 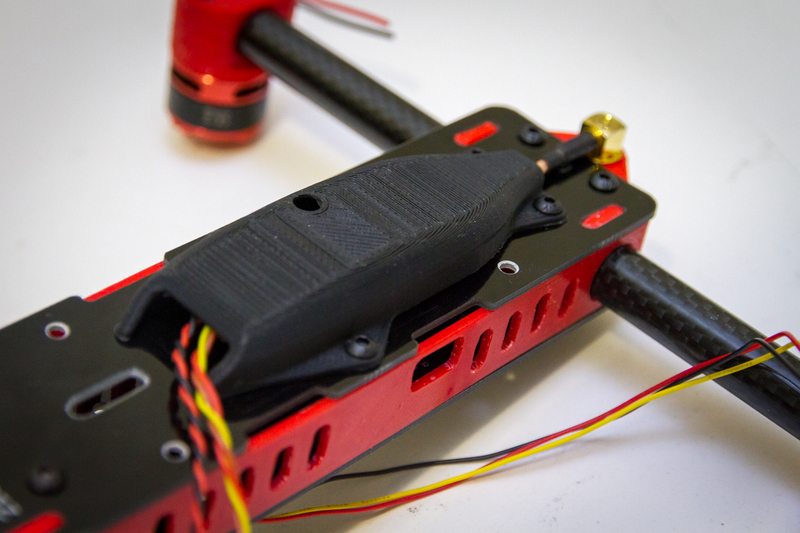 The remaining connectors may need to be bent down slightly to dip under the ESC connectors on the flight controller. Once modified seal the receiver with heat shrink, you may need to cut a small window for the Smart Port connector. Zip tie it in place on the same board as the flight controller. It is easiest to assemble the frame upside down. The power distribution board is the top panel, the receiver and Naze32 are on the inside of the bottom pannel. Push the standoffs in to their holes and loosely fasten them to the power distribution board with screws. Put the arms roughly in place, the friction on the standoffs should be enough to keep everything in place. I found the easiest way to get the motor mounts on to the tube was to first screw the two pieces on to the bottom of the motor (do not tighten but ensure there is a couple of turns of thread engaged) before sliding the clamp on to the end of the tube. Connect the ESC’s, 5v and Vbatt to the flight controller then roll the bottom board over on to the bottom of the frame, poke the antennae out a couple of the side windows whilst tucking all the wires into the frame. When closing up the body be careful that no wires are pinched between the side panels and the PCB’s. Before locking everything down ensure that the arms are centered (measure from the side of the PCB to the inside of the motor mount) and that the motors are vertical. Rather than simply eye balling this put your propellers on and ensure the tips meet at the same level. 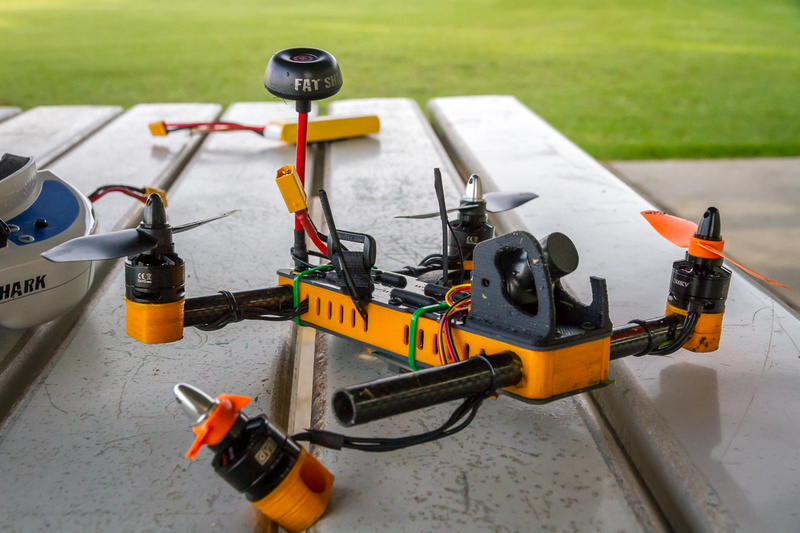 Remove your propellers before connecting any power. Position 4 sticky feet around the battery wire penetration slot and battery strap to support the battery. Setup auxiliary switches on the Modes tab as you would like. I typically assign a switch to ARM and a 3 position switch to ANGLE/HORIZON/RATE. You will then need to connect a battery (no propellers attached!) to ensure everything on the receiver tab is coming through correctly. From here all the usual maiden flight checks and safety procedures apply. If you have any questions about the build or would like more images or information about something specific feel free to leave a comment here, visit the contact page or leave a comment on either the YouMagine or Thingiverse pages. If you build a 215 Hopper I would love to see the results. I have set up a form where you can tell me how it went and let me know where I can find some photos of your work. It has been brought to my attention that the original brd file that I upload had a fault on the vbat connector. The ground trace from said connector did not reach the main ground plane. Now uploaded is revision 2 of the board with this problem corrected. My apologies to anyone who has already made the board. 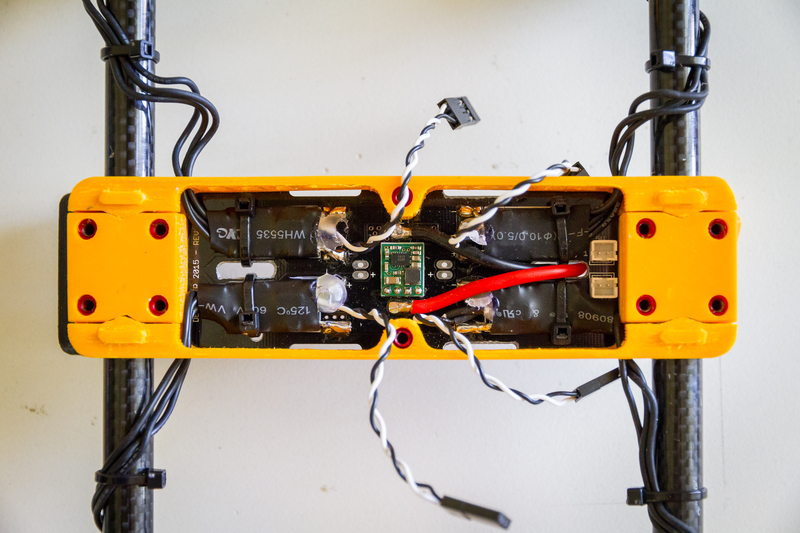 You will still be able to fly with it but you will need to forgo the connector for vbat and connect wires directly to the same pads as the battery leads (mind the polarity), or leave them off all together (mind you don’t over discharge your batteries). I have ordered a new batch myself so if anyone has already made boards and would like a corrected replacement get in touch. Just a quick update this evening. 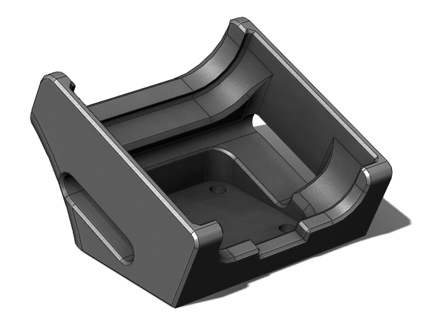 Shown here is is the first draft of a mount for the GoPro Hero4 Session on my 215 Hopper. I will need to check for propellor clearance on the side of the mount, there is clearance to the plastic but possibly not enough for a strap. If that does turn out to be problematic then I have an idea in mind for a plastic clip over the top. Also on the cards are two other ideas for less typical mounting positions that should both provide an interesting perspective.